It is yet another Bengali New Year, and Bongs all across cannot keep their calm for Poila Baisakh. Also spelt as Pohela or Pohila Boishakh, it is not just the first day of the year to Hindu Bengali calendar, but also a significant emotion. People donning in new clothes, welcome the new year with much fervour and enthusiasm. According to the Hindu lunisolar calendar, Pohela Boishakh 2019 will be celebrated on April 15. As we near the Bengali New Year 2019, all the Bengalis around the world will gear up for the preparations to make the best and mouth watering traditional food to share with friends and family. Of course, Bongs are a pro and best-known for their delicacies, and if you want to try something new this festive time, below we have provided authentic Bengali food recipe videos to binge on and make Noboborsho 2019, yet another memorable event. Know History & Significance Behind the Celebration of Bengali New Year. As Bengalis celebrate Pohela Boishakh, people from other Hindu communities across India, observes the traditional solar new year, under different names, such as Vaisakhi in central and north India, Vishu in Kerala and Puthandu in Tamil Nadu. Amidst all the festivities, Pahela Baishakh is the largest and most widely celebrated festival observed by Bangla speaking people. On the Bengali New Year, individuals greet each other, traditionally saying, শুভ নববর্ষ, Shubho Noboborsho, which literally means, "Happy New Year." And no festival in India can ever be complete with their finger-licking traditional food. As Bongs are famous for their authentic cuisines, check out the Bengali food recipes that you must try during this Poila Baisakh. From Panakam to Paruppu Payasam, Relish These Traditional Tamil New Year Dishes. The first meal that is served among the people after all rituals on the Bengali New Year, is the one of the most-loved Luchi (Bengali pooris), cholar dal (curry prepared from Chana Dal) with coconut pieces and Aloor dum (thick and creamy gravy made from potato). This delicious breakfast gives the perfect kick-start to the festivity of Bengali New Year. Shorshe ilish (mustard hilsha) is the ultimate recipe to adorn your plate and gratify your appetite. A great accompaniment with steamed rice, Bhapa Ilish is the best dish that is a must try during this traditional Hindu festivity. Just be safe of those very thin fish bones. Next, the menu consists of some meaty elements. Mutton Kosha is what finally provides the richness anyone had been anticipating during their meal. Chunks of goat meat and potatoes cooked in an onion-ginger-garlic gravy with generous portions of tomatoes, dahi or plain yoghurt and pure mustard oil, gives with the fiery and spicy jhal kosha mangsho. This cannot be missed from your Noboborsho menu. A Bengali prawn curry, where prawns are cooked in spices and coconut milk, which makes a thick curry dish. Served with rice, the flavoured prawn curry, aka, Chingri Macher Malai Curry is the winner on your dinner table when served with cooked rice. Any Bengali festival becomes perfect when you try out kacha aamer chutney or (raw mango chutney) either on its own or mix it straight with mutton curry and rice. The sweet-tangy melodramatic sensations have only won hearts in any Bengali religious festivities. It is also a summer unique condiment, which is good for your already-filled tummy. Obviously, no Bengali festivity can end without the sweet packed with the goodness of thickened milk and jaggery, mishti doi. This one chilled delight, enjoys an affluent fanbase across the country. Mishti doi after a meal quickly cools you down, leaving a pleasant flavour behind. 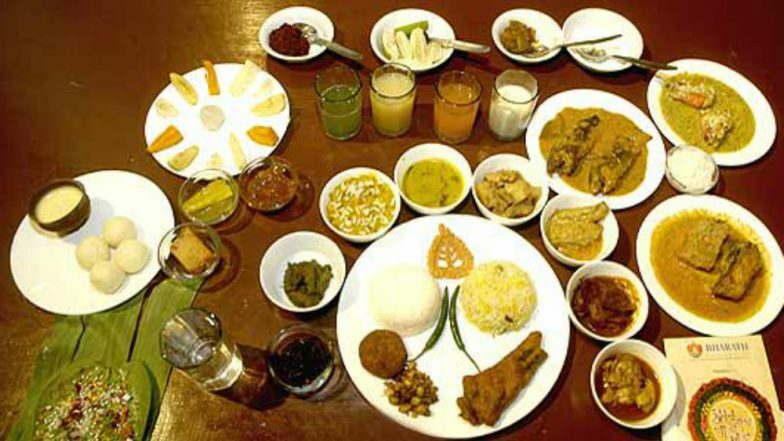 Bengali festivals always turn out to be a 'feast-ival' because of its traditional food menu. The authentic cuisine is as rich as its literature, as sweet as the language itself and being stuffed with food while an indulging in healthy conversations with friends and family around the dining table is all part of Poila Boishakh. Shubho Nobobarsho, everyone.